excision of a full-thickness piece of the iris. 1. Excision of a portion of the iris. 2. The hole in the iris produced by a surgical iridectomy. /iri·dec·to·my/ (-me) excision of part of the iris. Surgical removal of part of the iris of the eye. surgical removal of part of the iris of the eye. It is performed most often to restore drainage of the aqueous humor in glaucoma or to remove a foreign body or a malignant tumor. An incision is made through the cornea, and the iris is grasped with forceps or a hook and drawn out through the incision. The affected area is cut away, and the elastic iris is allowed to slip back into place. Subjunctival antibiotics may be instilled, and an eye pad is applied. After surgery, the patient is observed for signs of local hemorrhage or excessive pain. Eye surgery Partial excision of the iris, see there. Surgical removal of part or all of the IRIS of the eye, for the treatment of an iris tumour or to allow free circulation of the AQUEOUS HUMOUR. The term ‘peripheral iridectomy’ is used to refer to the production of a small hole in the iris near the root, but this should more properly be called an iridotomy. Iridotomy is usually performed, as an outpatient procedure, with a laser. The surgical removal of part of the iris. The main reasons for iridectomy are to reduce the intraocular pressure, to enlarge an abnormally small pupil, to excise an iris tumour and, in cataract extraction, to prevent possible blockage of the angle of the anterior chamber. 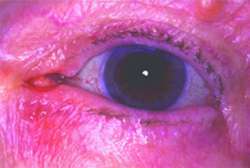 Nowadays, laser iridotomy is preferred in the treatment of angle-closure glaucoma because the incision obtained by this technique can be carried out as an outpatient procedure with only topical anaesthesia, although the cornea must not be hazy (Fig. I16). See iridotomy. excision of part of the iris. the peripheral or basal portion is removed. a sector, from pupillary margin to base, is removed. This case 52/F Yes Source, y Presentation Treatment Follow-up, mo Okamoto et al, (15) 1982 ACR Iridectomy Jellie et al, (16) 1989 Incidental Biopsy Eide et al, (17) 1997 EU Iridectomy ANED, 7 Tulvatana et al, (6) 2003 Pain Iridectomy DUC, 12 Tuncer et al, (18) 2004 EU Iridectomy ANED, 144 This case Incidental Iridectomy ANED, 8 Abbreviations: ACR, anterior chamber reaction; ANED, alive, no evidence of disease; DUC, dead of unknown cause; EM, electron microscopy; EU, ectropion uvea; I, inferior; IN, inferonasal; IT, inferotemporal; N, nasal; ST, superotemporal; STUMP, smooth muscle tumor of uncertain malignant potential. In a com a sec rem ift In a complete iridectomy, a section of the iris is removed. 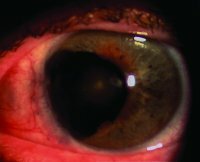 Evaluation of the outcomes of one-site combined phacotrabeculectomy using sutureless tunnel technique without peripheral iridectomy in open angle glaucoma patients. First, the lens was removed from a given eye by using ultrafine iridectomy scissors and number 5 Dumont forceps (Fig. The proportion of visualized ciliary processes depends on the extent of iris defect, which ranges from peripheral iridectomy to aniridia. Iris condition was evaluated and abnormalities like peripheral buttonhole iridectomy, iritis, rubeosis, atrophic patches, heterochromia, synechiae, nodules were looked for. Surgical procedures such as cataract extraction or peripheral iridectomy, which have encountered complications, can result in iris damage and pupil shape abnormalities. With the tadpole under a dissecting scope, we used iridectomy scissors to remove the outermost posterior labial tooth row (P-3). This is usually a peripheral iridectomy where a small opening at the edge of the iris is made so liquid can drain more easily. Isolation and culture of iris pigment epithelium from iridectomy specimens of eyes with and without pseudoexfoliation syndrome. Surgical interventions such as sphincterectomy (dissection of the sphincter), peripheral iridectomy, or vitreous prolapse in cataract surgery complicated by posterior capsule rupture, can also affect the shape of the pupil. The PM was accessed by removing the first two scales and then excised with iridectomy scissors.